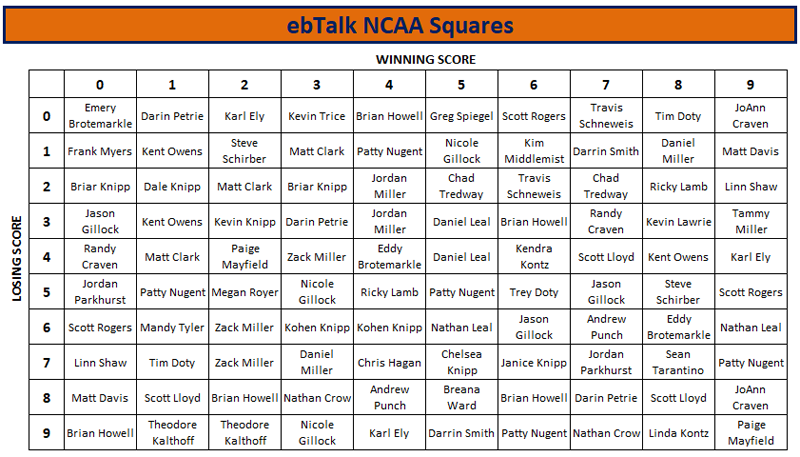 Limited to first 100 entries - All squares awarded at random after all 100 are taken. - In the example, the 9 represents the winning score and the 8 represents the losing score. - If the winning team scores ends in a 9 (i.e. 59) and the losing team score ends in an 8 (i.e. 48), you win. - Your square will be the same for all 68 games in the tournament. - The payout for each game escalates after each round. - It's possible you can win multiple times throughout the tournament.